Hey girl hey! If you’re anything like me, you do everything last minute. #procrastinationnation. I don’t think I’m wired to do things way ahead of time, and Christmas shopping is no different. There are so many people to buy for with all different interests. In today’s post, I’m giving you some ideas for the beauty lover in your life. If you want some great ideas on what to buy with any budget, keep on scrolling! I am a huge sucker for gift sets during the holidays. They’re typically a super good value, and they’re always packaged gorgeously! Who wouldn’t want an adorable gift set waiting for them under the tree? All of the gift sets below are linked, and can be found at Ulta! This set is for the skincare junkie on the go. These facial sprays are the best of the best! Each of them works for all skin types, and refreshes the skim with just a few mists. I try to keep the Rose Water spray in my bag at all times. This year has been the year of liquid glitters and shadows for a pop of drama on the lids. Stila came out with the BEST over the past year or two. Their formula is fallout-free, long wearing, and comes in a ton of shades and glitters. To say I’m obsessed is an understatement! Bareminerals KILLS IT with their liquid lip formula. These minis are the perfect discovery into the formula. They’re also a great size to throw in your bag on the go. Your lips will love these lipsticks! This set is perfect for the friend who’s brows are always on fleek. It comes with a full arsenal of products to keep your brows looking amazing all day long. I am obsessed with Benefit’s brow pencil, which comes in this set. Such a good deal for all the goodies you get! The Naked Cherry Palette seemed to take the internet by storm this year, and rightfully so! It comes with such gorgeous, on-trend reds and pinks that are perfect for the makeup expert in your life. Plus, there are three lipsticks and two liners in the vault to complete the look. This particular gift set is online only. Who doesn’t love a good mask? PTR has you covered with six different mask that target different concerns. I have tried all of them, and am obsessed with every single one! Mini sizes of masks are the perfect way to try before you commit to a full size of your favorite one. This year, I fell in LOVE with Kopari! Their products are all made with coconut oil, and they smell absolutely amazing. This gift set features a shower gel, a scrub, and a body milk, all infused with coconut. Definitely a great gift for the friend who needs pampered! If you haven’t tried Drybar yet, run to your nearest Ulta and pick up literally everything they have. 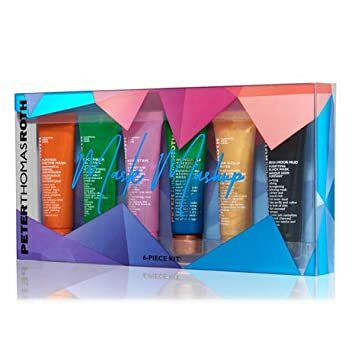 I love the way my hair feels after using their products, and this gift set has three of my faves! This set comes with a heat protectant, dry shampoo, and a volumizing styling spray. Bonus: they all smell incredible. I always tell my clients and friends alike to invest in brushes, and Morphe has some of my faves. This set, curated by Jaclyn Hill, contains 8 of her favorite brushes for blending and applying eyeshadows. If you have a friend who is looking to up their brush game, grab this set! The holidays are perfect for repackaged or reimagined versions of OG faves! These brushes with a limited edition ombre handle are the perfect gift for your bougie friend who loves glitz and glam. It Cosmetics’ brushes are always so soft and apply makeup so evenly. You’ll definitely want to pick this set up for a flawless highlight! There ya have it! Those are my picks for the best last minute beauty gifts! Are you done with Christmas shopping yet? Let me know in the comments below what you’re planning on picking up!